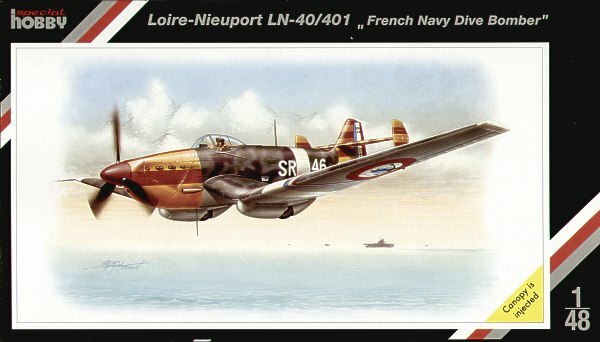 Loire Nieuport LN40/401 "French Navy Dive Bomber"
The French LN-40 series dive bombers participated in the Battle of France in the face of the overwhelming supremacy of German fighter aircraft. Nevertheless, the French pilots must be appreciated for their fighting spirit and courage in fighting the advancing German tanks. The remaining machines served as training aircraft in the Vichy Republic. The kit consists of plastic, resin and photo-etched parts. Parts are provided for building either LN-40 or LN-401. The decals offer two LN-401 machines from 1940, which participated in combat in France. The last decal option is a colourful Vichy LN-40 trainer from 1943.